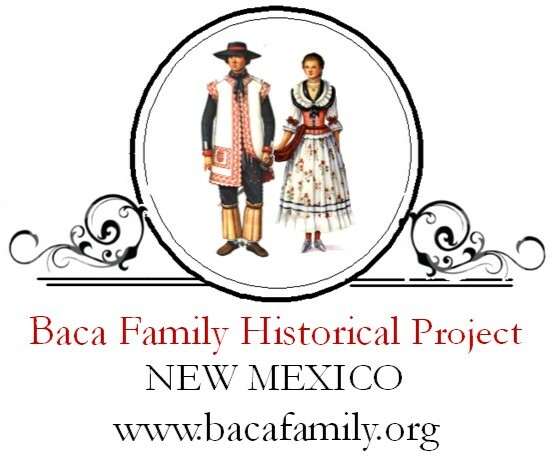 The progenitors of the Baca family of New Mexico were Cristóbal Baca (Vaca) and his wife Ana Ortiz. Cristóbal was a military captain who arrived in 1600 with his family in order to help reinforce the Spanish colonial Santa Fe de Nuevo Mexico province in the Viceroyalty of New Spain (colonial México). At the time, they had three grown daughters and a small son. The Bacas had another son while living in Nuevo Mexico. The family then moved to Grants, New Mexico (Wikipedia). With approval, the recruitment began in late summer of 1599. 65 Spaniards and 25 servants were recruited at Mexico City. By October 1599, recruits, including women, children, and servants, were at the outpost of Santa Barbara in the Valle de San Bartolome in Nueva Vizcaya. After some delay, these settlers began their journey to New Mexico in late September 1600 on the route of El Camino Real de Tierra Adentro, the route that Onate had taken in the original expedition of 1598 and which by now had stopping-places about every ten miles. The group arrived at Onate’s colony on December 24, 1600. Many of these settlers became discouraged and disappointed and left in late October 1601. The families that remained from the second wave of colonization are common ancestors for people with Hispano roots in colonial New Mexico. Cpt. Cristobal Baca, a native of Mexico City, Nueva Espana, and his wife, Dona Ana Ortiz y Pacheco, also a native of Mexico City, Nueva Espana, brought 3 daughters and a son with them to New Mexico. Another son, Alonso Baca, was born in New Mexico. Through him, the Baca family name was passed on to following generations.